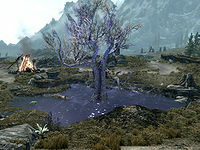 Sleeping Tree Sap is considered a legal drug in Skyrim and is highly valued for its ability to make people feel much healthier for a time, although side effects include temporary slowness and blurry purple vision. A spigot was installed on the Sleeping Tree in Whiterun Hold to harvest the sap, and the Khajiit trading caravans have been known to pay highly for samples. For game-specific information, see the Skyrim camp, cave, sap and quest articles. ^ Ysolda's dialogue in Skyrim.